It seems there has been a rash of Gmail accounts being wiped out after upgrading to iOs 9. Tweets are flying in, posts at the Gmail Product Forums have been piling up and multipe other message boards have many users reporting similar stories. Even the IB Times has reported on this issue. There have even been reports coming in that this is not only effecting Gmail users, but also Outlook.com and Yahoo.com users alike. Some users have reported finding their emails still in trash, others are finding them under the Important Label, while still others are reporting complete disappearance. What is most frightening about this issue is that it is not only occurring on your iOs device, it is wiping out your messages on the web as well. But what can you do to fix this. First look in the Trash and Important labels to find your emails. If you don't see them there, you should search in:anywhere and see what comes up. If nothing results from those searches, then the account has been completely wiped out by Apple Mail. Your next step is to attempt to follow these steps to recover permanently deleted emails. To try, you need to be very polite in your requests and you must mention the emails were deleted as a result of upgrading to iOs 9. The first step is to completely secure your account by following the steps here and choosing "I can still sign into my account"
Then you need to file a report to Gmail, making sure you detail, politely, that your emails were deleted as a result of upgrading to iOs 9. You can file your report by clicking here. You must make sure you take the steps to secure your account first before you move to the filing report step. The team will do their best to restore your emails and you will be notified if anything can be done. You should also consider removing your Gmail account from the Apple Mail app and use the Gmail app to prevent this from happening again as many users have reported this repeating after restoring their emails, sometimes the same day and some times days/weeks later. Until Apple acknowledges this bug and fixes it, I highly recommend not using the Apple Mail app for your Gmail accounts. Please do make sure you make Apple aware of this issue, otherwise they will ignore it and claim it has nothing to do with them. 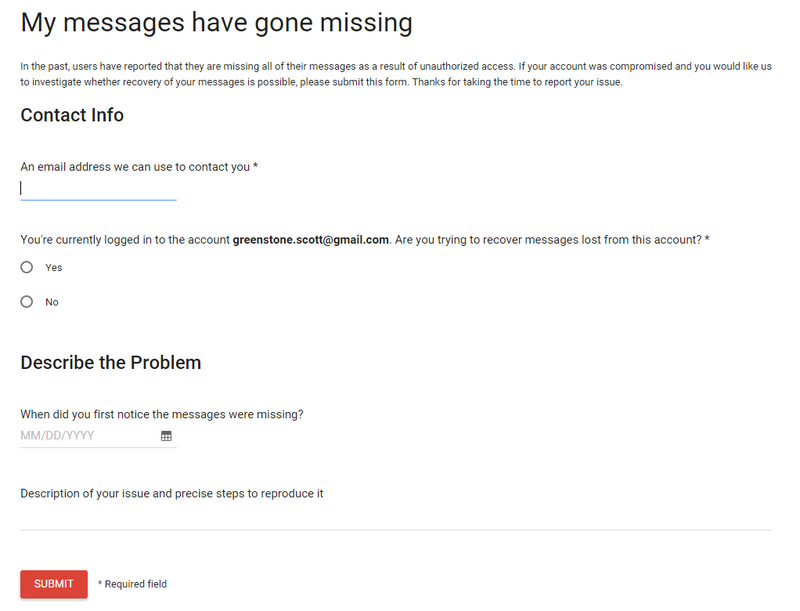 Please note, these steps can be found on the Gmail Support website here.